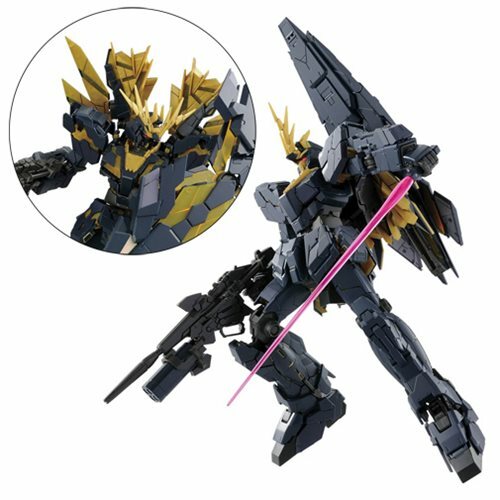 The advanced frame work unique to the Real Grade series allows the Gundam UC Unicorn Gundam 02 Banshee Norn Real Grade 1:144 Scale Model Kit to transform smoothly between its two modes and lock into place. This intricate Lock Mechanism secures parts of the kit during transformation and adds a high level of stability. A Link Mechanism has also been integrated into the MS joins to allow for less assembly steps while allowing smooth articulation. The Banshee's iconic dark navy colors are expertly reproduced using colored plastic parts with different hues of navy for added depth. Its two types of iconic Armed Armors and head units have been recreated with realistic detailing. Choose between one articulated or two fixed head unit antennas, the largest and most distinct feature of the Banshee Norn, all of which are included! The newly designed Armed Armor XC integrates clear parts into sections of the Psycho-Frame, which are revealed when the kit is transformed into Destroy Mode. The Armed Armor DE also has newly designed parts including lock mechanisms into sections of the unfolding unit to add stability during Unicorn Mode. Included with this kit are an array of weaponry! Equip the Banshee Norn's Beam Jutte by replacing parts of the Revolving Launcher, which is attached to the Beam Magnum. The magazine can also be equipped to the rear armor. The Gundam UC Unicorn Gundam 02 Banshee Norn Real Grade 1:144 Scale Model Kit includes 1x Beam Magnum, 1x Revolving Launcher, Armer Armor DE, Armed Armor XC, Beam Saber, 2x Beam Sabers, 20x Runner, 1x Realistic decal sheet, and 1x Instruction manual. Measures about 5-inches tall. Ages 15 and up.